Its the Sunday after Christmas. Michele’s at her Moms. There’s a raging blizzard right outside the windows. No sun for two day but the batteries are full from the wind generator cranking full out for hours. Bare ground in the outdoor garden a week ago has been replaced by three feet of snow. Moving around outside has become difficult and visibility is near zero. Time to go grocery shopping! I’ve been doing chores all morning and its time for food. 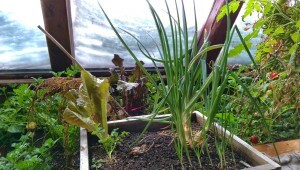 Just inside the windows there’s ripe tomatoes and baby chard from the indoor garden. Michele gathered onions from the outdoor garden on the solstice so I grab a piece. Throw in a couple of eggs I just gathered from the chickens and I have the makings for a meal. I’m lamenting the end of the fresh onions for the year when I notice a flat of good sized starts ready to go in the indoor garden. Nice! I love shopping here!